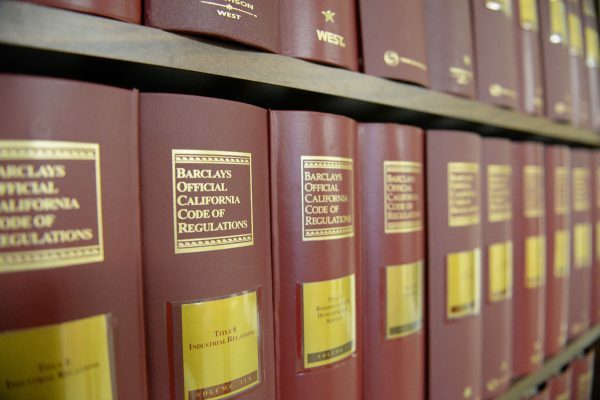 California Code of Regulations (CCR) — The online source for regulations adopted, amended, or repealed by state agencies pursuant to the Administrative Procedure Act (APA). The California State Regulatory Agency List contains a list of state agencies and their corresponding CCR titles and regulation sections. The California Regulatory Notice Register (Notice Register) — OAL’s weekly publication containing notices of proposed regulatory action and other notices issued by California state agencies. California Rulemaking Law under the Administrative Procedure Act — Published by OAL and available for purchase, this annotated compilation contains the rulemaking portion of the Administrative Procedure Act, OAL’s implementing regulations, other statutes relevant to the rulemaking process, and a comprehensive index. Rulemaking Checklists and Calculators — OAL’s checklists contain APA requirements for various types of rulemakings, as well as for notices of proposed regulatory action. OAL’s date calculators are helpful in planning comment periods and publishing documents in the California Regulatory Notice Register. Rulemaking Calendar — The annual list of projected rulemaking activities of state agencies implementing statutes enacted by the Legislature during the previous year and years prior. Disapproval Decisions — OAL’s written opinions detailing the reason(s) OAL has disapproved a specific proposed rulemaking action. What is a Regulation (pdf) — Step-by-step analysis of what is legally defined as a “regulation” and what must be adopted pursuant to the APA. Section 280 Certifications — Section 280 certifications address rules that have been challenged as underground regulations that state agencies have certified they will not issue, use, enforce or attempt to enforce. Forms — The Standard Form 400 (required for the submission of regulations or notices with OAL); the Standard Form 399 (the Economic and Fiscal Impact Statement), and “Delegation of Authority” forms Delegation of Authority for STD 400 and Delegation of Authority for STD 399. Guide to Public Participation in the Regulatory Process (PDF): This guide provides an overview of what must be adopted pursuant to the APA as well as an overview of the regular and emergency rulemaking processes.